INTRODUCTION The great security political paradigm shift in 1989/90 has not just launched the end of the communistic regimes in East- and South East Europe, but started the process of disintegration for some multinational states. Whereas this disintegration process happened peacefully in some parts, e.g. in the former Czechoslovakia, the disintegration of the Socialist Federal Republic of Yugoslavia was accompanied by military conflicts, "ethnic cleansing" and an enormous number of refugees and expellees. More than a decade later - after the war in the Western Balkans has become a main issue of the European security policy - there are no military conflicts between the opposing parties due to the international military presence, though the future of this multiethnic region is still open. 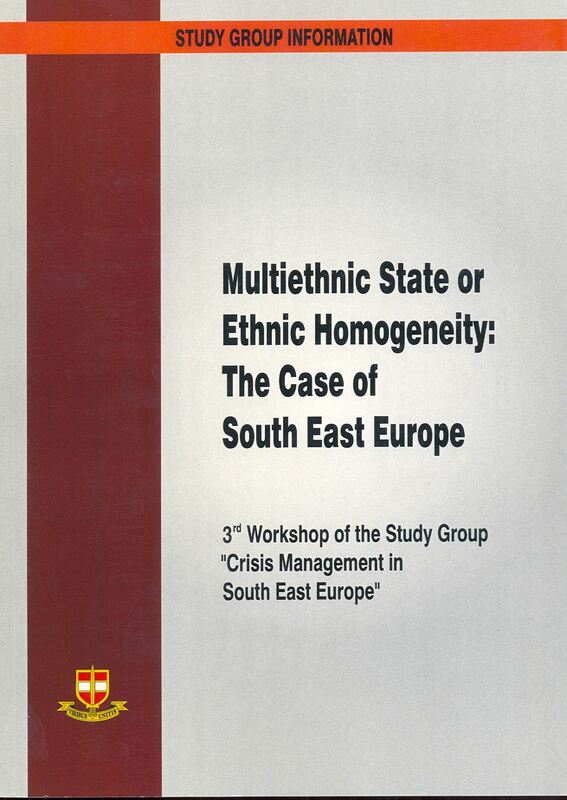 In the course of the second Reichenau workshop on "Multiethnic State or Ethnic Homogeneity - the Case of South East Europe" of the PfP Consortium Working Group "Crisis Management in South East Europe", held between May 9 to 13, 2001, an approach was attempted to clarify whether multiethnic states in South East Europe still have a hope after such horrible wars. The articles published hereunder give a very good insight into the discussion, which was sometimes very controversial due to the sensitivity of the topic. In this context the relevant keywords are "State Sovereignty versus Right of Self-determination", "Multiethnic State versus Ethnic Homogeneity", "Border Changes versus Territorial Status quo". The conflict areas which have been discussed as case studies are the development in Bosnia and Herzegovina as well as optional solutions for the "Albanian Question". Beside the main subject "Former Yugoslavia", this book also deals with the political challenge that is given to Europe by the relevance of the elements "National Identity" and "Ethnicity". This challenge is discussed especially in the articles on inter-ethnic relations in Bulgaria and the ethno-political conflict in Moldova. Another point which is discussed is the central role and responsibility of Media in preventing armed conflicts in multi-ethnic societies.